Architect: Eero Saarinen & Assocs. In Stanley Kubrick's film masterpiece, "2001 - A Space Odyssey," a mysterious black monolith puzzles and mystifies prehistoric apes and man. 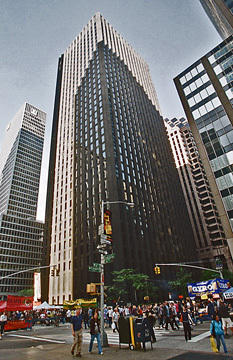 In midtown Manhattan, the "Black Rock," as this headquarters building of CBS is popularly known, has befuddled and confounded architecture critics since its inception. Is it great architecture or bad urbanism? Like most real-life either/or questions, it isn't that simple. This 38-story, sheer, freestanding tower set in its own shallow sunken plaza is unquestionably great architecture because it is original, consistent, boldly expressed and daring. Initially, some observers did not like its dark coloration, and considered sunken plazas anathema and its aloofness rather condescending and disrespectful of the common man, that is, the pedestrian. These attributes, however, were not really negatives given its context of fronting on an avenue whose smile then displayed many broken and missing teeth because of the existing irregular pattern of nearby public plazas. Moreover, its context along the Avenue of the Americas was generally undistinguished design. The CBS Building's proportions and rhythmic facades are, in fact, far better than those of the celebrated Seagram Building across town on Park Avenue. This is a powerful building, whose angled piers thrust skyward with great energy, assertively expressing its dynamic structuralism in a manner that makes the Seagram Building almost seem dainty and frail. An important key to its cohesive expression is the equal division of its facades into five-foot-wide sections of piers and large, vertical, single-pane windows. Simplicity and focus are this building's bywords. The angled piers are actually load-bearing and not curtain-wall applications. The piers are concrete and hollow to contain ducts for the building's heating, ventilating and air-conditioning (HVAC) equipment. They are clad in Canadian black granite and meet at the building's corners where they make a 45-degree angle with the plane of each facade. The granite cladding of the piers is not polished which flattens and breaks up the reflectively of the windows. It would be interesting to envision the effect had the cladding been polished. Such a treatment would have made the building appear much more faceted with interesting reflective patterns, but it would also have lessened the tower's boldness as the duller, unpolished granite creates a denser and deeper facade appearance and not necessarily a "deader" one. The east side of the ground floor is occupied by a restaurant that originally was called The Ground Floor and now has been redesigned by the very elegant China Grill, which is one of the most attractive in the city. The shallow plaza is bereft of public seating although a low perimeter wall fulfills part of that need. The Deutsche Bank Building's through-block plaza directly to the east of the CBS building, fortunately provides more open space and, indeed, is one of the most attractive in the city. The Deutsche Bank Building, however, significantly blocks most of the views from the east of the CBS Building and its pink granite cladding and exterior design does not relate at all to the CBS Building and pales in comparison. Inasmuch as the historic character of midtown is a chaotic melange of contrasting styles, CBS's arrogant tower cannot be faulted terribly on account of its great strength, which is simple a challenge for its neighbors to meet and, indeed, the owners of the former J. P. Penney directly across the avenue reclad their tower and added three large, bright green bronze sculptures of women by Jim Dine that enliven the streetscape and actually would be fine sitting in front of the CBS Building. The wonderful sculpture, "Lapstrake," by Jesus Bautista Moroles, in the Deutsche Bank Building Plaza actually is a better foil to the CBS Building than its own building. The building is often referred to as the "Black Box," but the black granite more often appears to be dark gray. Like the Solomon R. Guggenheim Museum designed by Frank Lloyd Wright at Fifth Avenue and 88th Street, this building needs more space to be appreciated as a sculptural object. 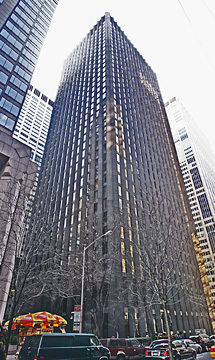 When it was erected, CBS was a very powerful television network headed by William Paley and the building was clearly meant to be an architectural competitor to the former RCA Building, now the GE Building at 30 Rockefeller Plaza, which houses many facilities of the NBC television network. Obviously, a much smaller project, nonetheless it was intended to be an important architectural statement. Its arrogant posturing has been diminished by the renaissance in the late 1990's of Times Square and the flamboyance of some later towers such as Citicorp Center on Lexington Avenue at 63rd Street. It really is not a masterpiece because its proportions are a bit bulky and its massing falls short of being brutalistic enough to be truly memorable. Brutalism was an architectural style of the period, best personified by the Whitney Museum of Modern Art on Madison Avenue at 75th Street, designed by Marcel Breuer, and the former PanAm, now MetLife Building straddling Park Avenue at 55th Street, designed by Walter Gropius. Still, this building has an elegance that is neither under- or overstated, something that was very much needed for this avenue.